The Ferretti Yacht 650 immediately strikes the eye for its extensively renovated profile, which makes of it a truly distinctive model. 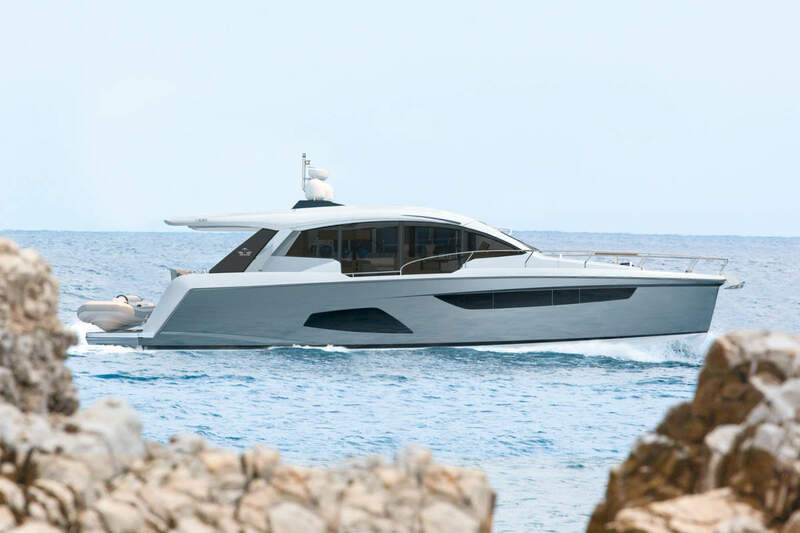 Its outer silhouette is characterised by an aerodynamic flybridge and new fibreglass decorative elements that “cut” through the profile of the glazing in the superstructure. 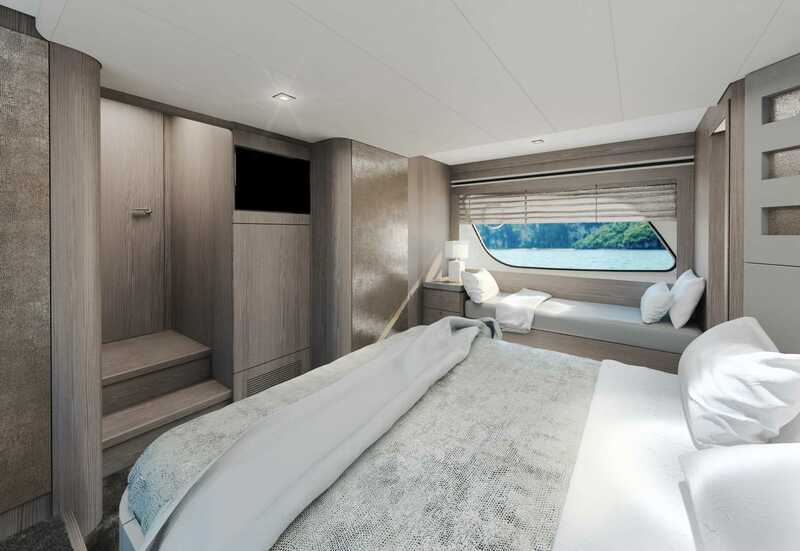 An unprecedented decoration connects the windows of the three cabins below deck (the master stateroom, the guest cabin, and the VIP cabin), which have been widened to let through even more natural light. The pilot station dashboard has also been restyled, resulting in an even more advanced and elegant look. 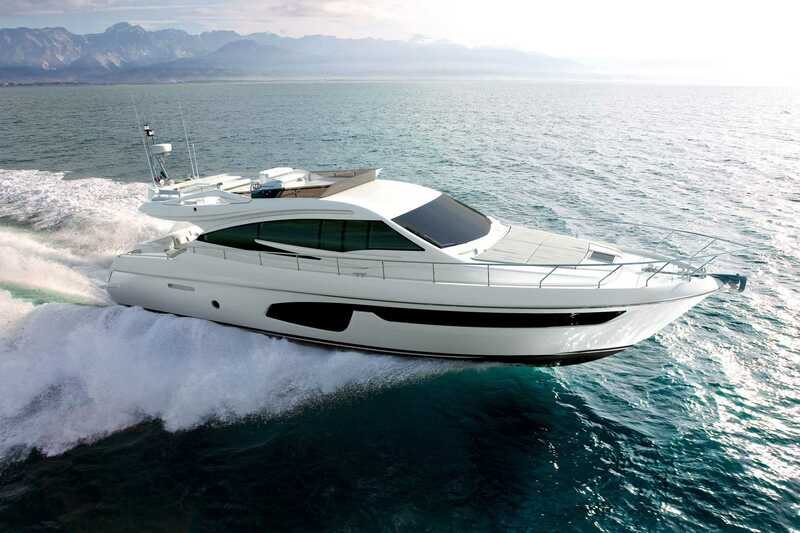 The slender lines of the Ferretti Yachts 650 (which is 19.67 metres/64 feet 6 in. long and has a beam of 5.25 metres/17 feet 3 in.) are further enhanced by the yacht’s aft area, specifically designed to ensure easy and safe storage and launch of the tender while increasing the guests’ onboard comfort. 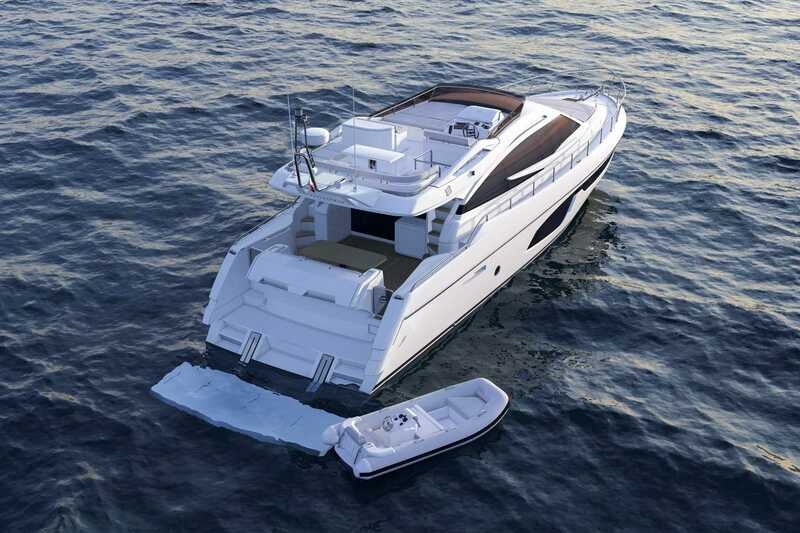 A tender lift has been developed, capable of lifting an over-3-metre-long tender that can be lowered into the water by a metre with respect to its original position, thereby allowing the vessel to be davit-free: a valuable attribute which provides an incredible amount of additional living space on the flybridge and a large aft storage compartment for smaller water toys and other equipment. 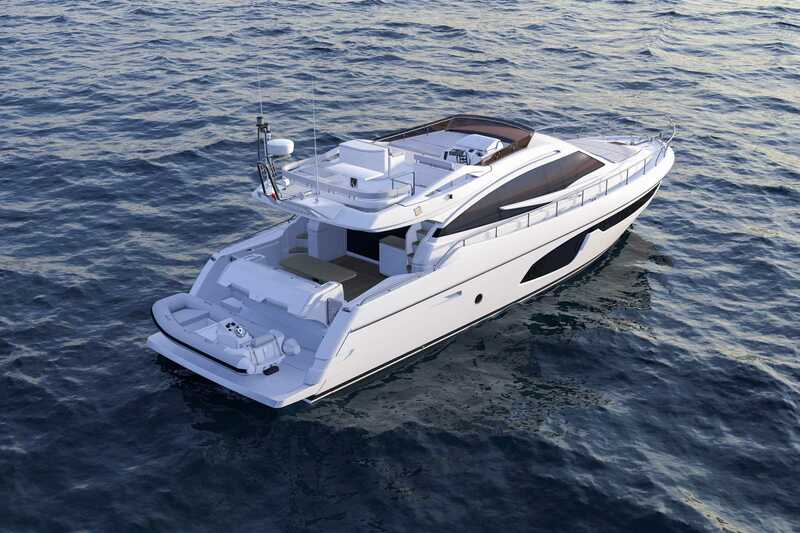 This creative solution, already present on several recent models, like the new Ferretti Yachts 750, is an important step forward in bringing features which are unique attributes Ferretti develops for mid-sized flybridge models over 70’, and now are available on the 650 for the benefit of boaters seeking an owner operated, extremely functional and advanced vessel with no compromises on safety or comfort. 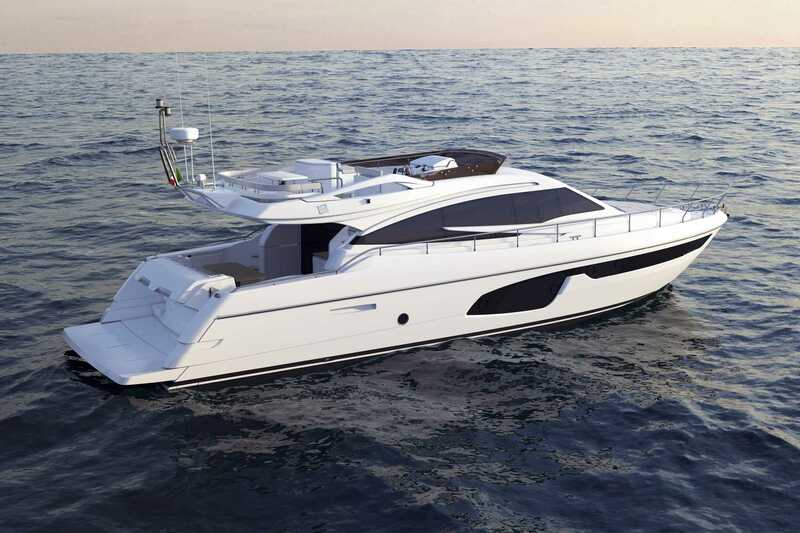 The Ferretti Yachts 650 redefines the meaning of a contemporary yacht which skilfully combines the discreet and timeless charm of all Ferretti crafts that feature excellent performance characteristics in terms of cruising and maximum speed as well as range, as well as outstanding technical solutions and the highest possible safety standards. User-friendly onboard instrumentation goes hand in hand with absolute comfort and liveability (some of the brand’s unmistakable hallmarks) on this yacht, which offers solutions capable of turning into reality the dreams of owners from all over the world, from the East to the West. Access to the cockpit is gained from the swimming platform, both from the port and starboard sides, thanks to two flights of steps integrated into the hull construction; a concealed electro-hydraulic gangway can also be installed on the starboard side upon request. At the centre of the cockpit is a large fixed wooden table, completed by an aft sofa and four free standing chairs. On the starboard side, near the window which can be raised reinforcing the relationship between the salon and the cockpit, stands a practical cabinet with a wooden top, featuring several storage compartments and a pre-fit section for the ice-maker. 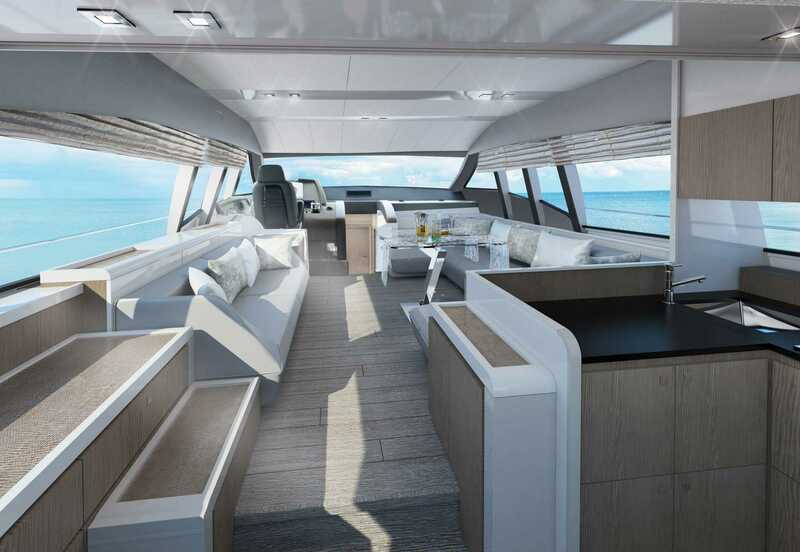 On the starboard side there are steps that lead to the flybridge, while on the opposite side a door opens towards the stairs to the crew quarters, which in the standard version includes a single cabin with separate head. A glazed door leads to the interior – a true open space forward until the windshield – that is functional and extensively renovated in terms of furnishings and décor. Stepping in, the galley, located on the starboard side, has been strategically positioned (like in all the “small” crafts in the range) to effectively connect the salon to the cockpit. In the standard version the galley is completely open and simply surrounded by two peninsular units near the entrance. 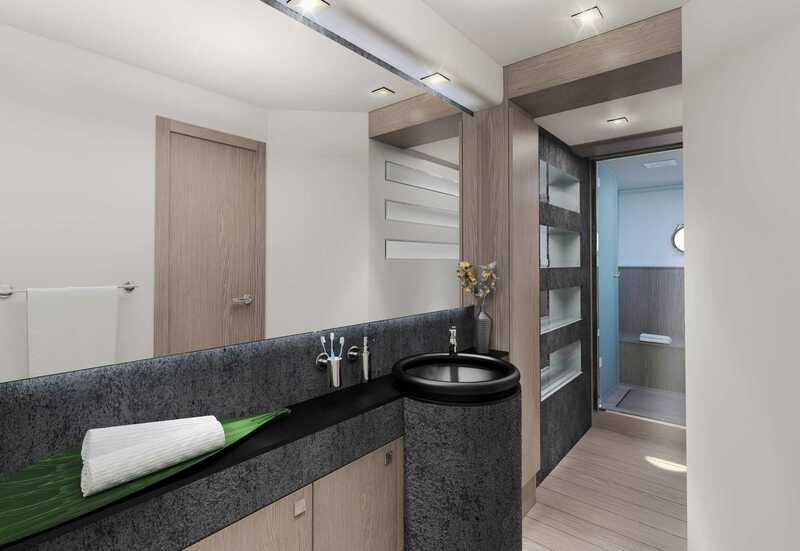 This solution allows to fully exploit this room as a large bar area opening onto the stern and towards the dining and living areas, further contributing to a sense of volume and making living onboard even more enjoyable – not to mention the extraordinary visibility ensured while cruising. Upon request by the Owner, however, the galley may also be closed with bulwarks. On the left, in front of the galley, are a cabinet with compartments for tableware and several drop-leaf door units concealing audio/video electronic appliances. Walking towards the bow, the dining area is located on the starboard side and is furnished with a large C-shaped sofa and an extendable glass table which seats up to six people guests. A second sofa stands on the opposite side; behind it is the TV, which can also be concealed upon request. An optional refrigerator/bottle rack can also be fitted in this area. The pilot station can be found beyond the sofa on the port side. The stairs beside it provide access to the lower deck. 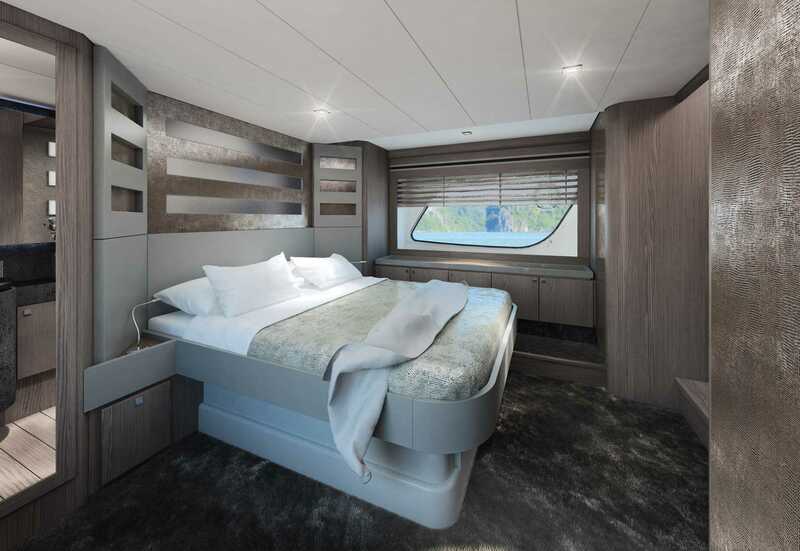 In this new project the underdeck layout draws inspiration from that of the Ferretti 620 and includes three double cabins and three separate heads, benefiting from the increased brightness thanks to the new glazing. The intelligent design also provides further sound isolation characteristics throughout the living quarters. The systems operating also at night time – such as the genset and the air conditioning – are installed at the extreme stern, in the engine room. The same is true for the anti-rolling gyro, which may be installed upon request. In this way, the distance between these systems and the Owner’s bed is extended to approximately 7 metres, with four sound proof bulwarks and three rooms (the sailor’s cabin, the tank and the owner’s bathroom) in between. The Owner’s quarters are located amidships and include the cabin, a full-beam head behind the bed, and a walk-in wardrobe. The cabin is furnished with a sofa on the starboard side and a vanity set on port side. Leaving the master’s cabin and stepping into the lobby, a storage room can be found, where a second “in-column” washing machine + tumble drier can be installed upon request, in addition to the standard one in the crew cabin. Continuing along the corridor towards the bow, the guest cabin, with twin beds and separate head – which may also be used as a day toilet -, is located on the right, while the double VIP cabin with private bathroom and separate shower is at the extreme bow. In the “TaiHe Dian” edition, the areas devoted to entertainment have been increased, turning the main deck into a large and liveable open space. The main difference in this special edition is that the galley is on the lower deck replacing the starboard guest cabin, and on the upper deck there is a large dinette. The central part of the salon as well as the two main cabins and third head have remained unchanged. 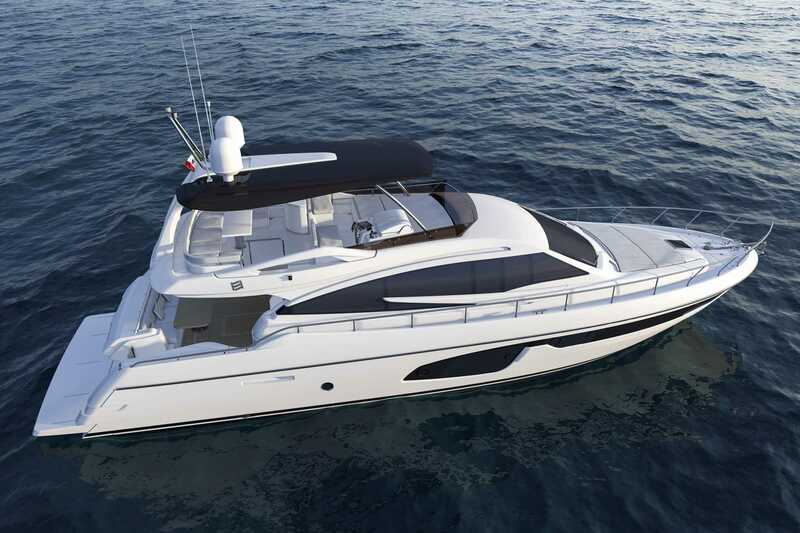 The sporty design of the flybridge emphasizes cues that are found on the most recent models in the range, with the typical side handrails that can also be found on the Ferretti Yachts 690 and new 750. A new aerodynamic support bracket for the radar and satellite systems has been installed aft. The alternative version can be fitted with a discreet and streamlined, bronze-coloured hard top which shelters the sundeck in its entirety. In the central part is the second pilot station, with the co-pilot seat on the left. Behind it, the bar area has been arranged, featuring a grill and a sink; aft, the C-shaped sofa and the large table can seat up to 8 people. Another large sunbathing area can be found at the extreme bow, on the wheelhouse. Some of the main innovations in this new project regard its outfitting and interior décor. Centro Stile’s team of architects and designers has indeed extensively restyled the entire yacht through a painstaking study that has led to the selection of new materials, new colour shades and, consequently, new colour and material combinations – an outfitting that results in an even more dynamic, brighter, and yet extremely refined style. All furniture is in “Silver Oak”, a new grey-silver oak wood featuring a discreet and elegant striped pattern. Upon request by the Owner – and in the first hull presented by the shipyard – all furniture tops are in leather, in the same shade of colour as the timber. All solid wood details – i.e. furniture edges and frames -, are featured in a sophisticated polished and lacquered material. The leather selected for the pilot station and the pilot seat is also new. The main deck ceiling pattern has been entirely restyled and adds even more personality to the interiors, with alternating horizontal stripes of ivory-shade leather and polished lacquered material, where the spotlights have been installed. 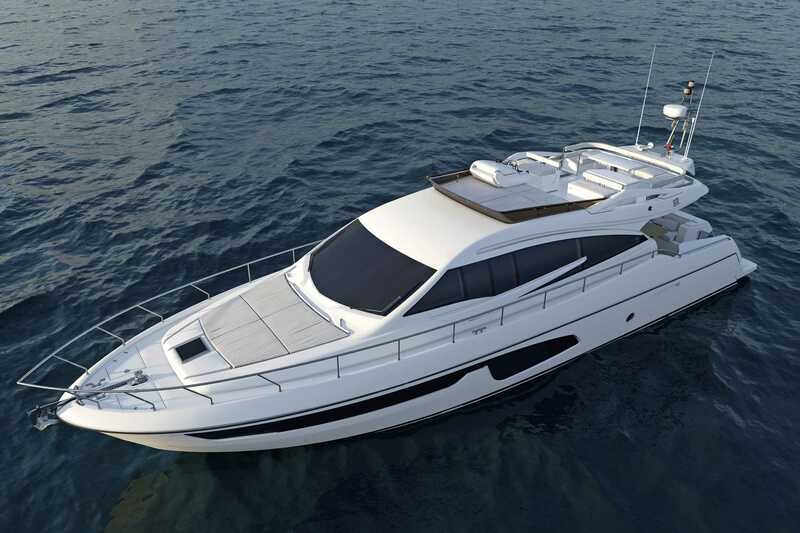 The entire lighting system on the first Ferretti Yachts 650 uses LED technology, both on the main and lower decks. 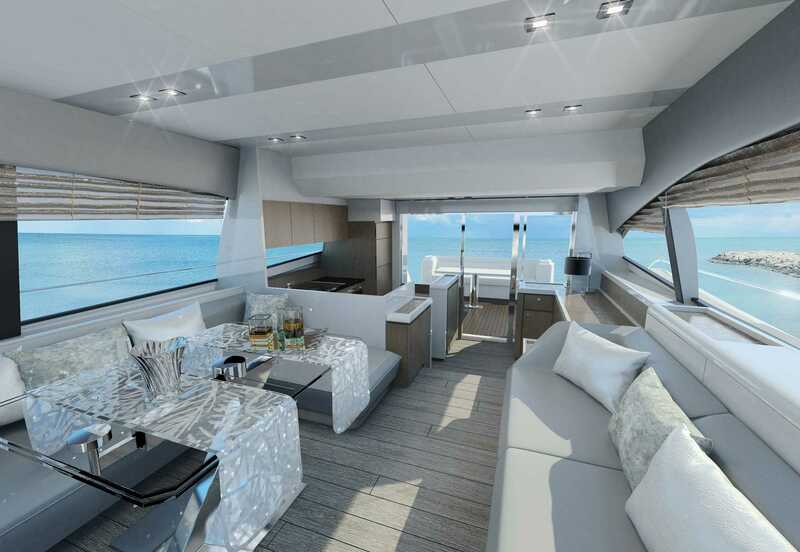 Onboard systems have been modified by installing soft-touch switches, thereby applying on this 65-footer a technical feature that so far had been exclusive to larger yachts only. The décor on the lower deck has been fully restyled and reinterpreted, with a special care for details in the guest cabins and heads. 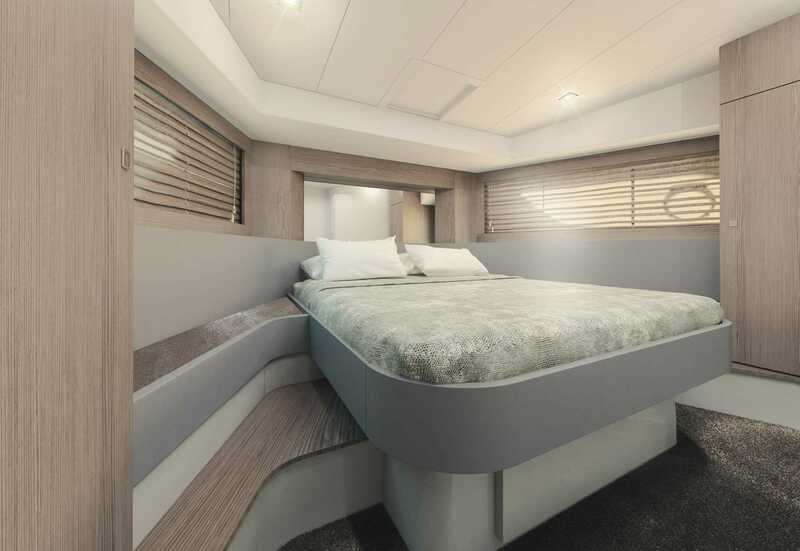 In the master cabin, the numerous leather inserts in the bed band and headboard are in the same shade of colour as the wood used throughout the entire boat. The wall dividing the cabin from the bathroom has been restyled and is now characterised by three satin Plexiglas inserts that alternate with leather inserts. The owner’s head is extremely stylish, with natural stone inserts on the shelves combined with a black top, in the same shade of colour as the wash basin. The large mirror is now jutting and “framed” by a LED backlighting system. The décor of the other two cabins and their heads is perfectly harmonised with that of the owner area. 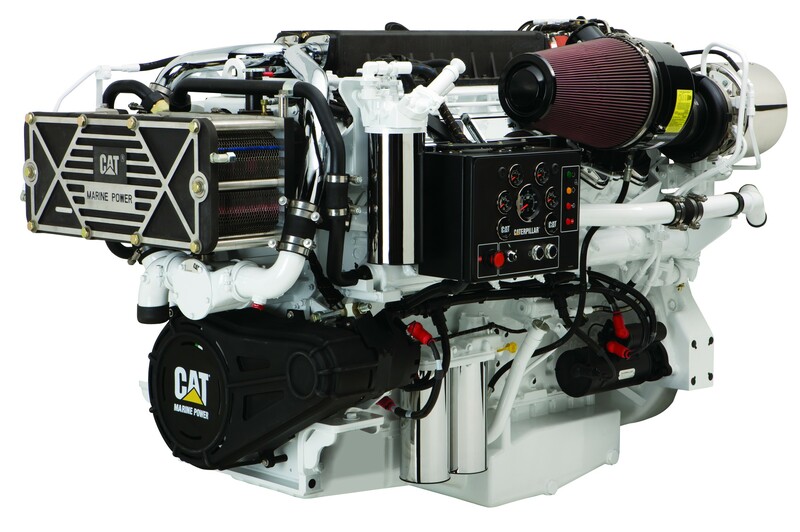 With Ferretti Yachts 650, the brand goes back to installing engines produced by Caterpillar, the American company that is one of the leaders in this sector and is also the supplier for Ferretti Group’s CRN mega-yachts. 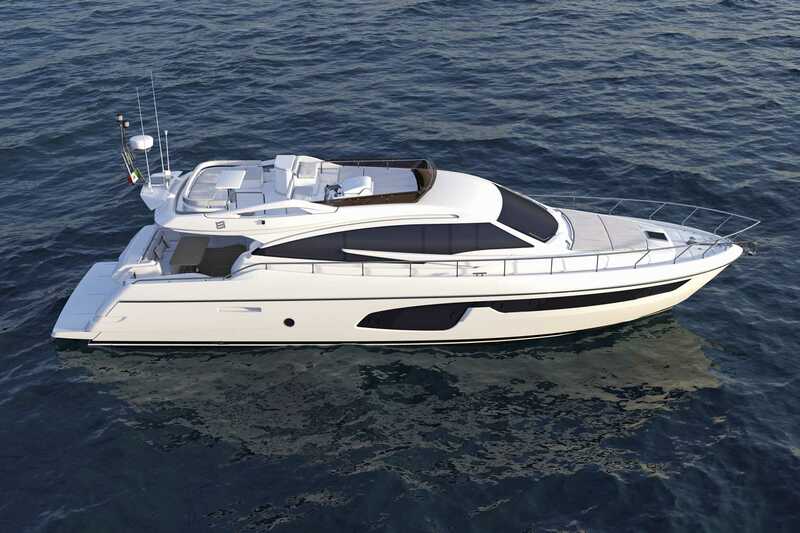 Ferretti Yachts 650 is equipped with a pair of CAT C18, a type of highly reliable engines ensuring very consistent performances, which in this case are perfectly in line with those of the Ferretti Yachts range. In the standard engine configuration – a pair of 1015 mhp C18 engines – the FY650 can indeed reach a cruising speed of 27 knots and a maximum speed of 30.5 knots. The optional engines (1150 mhp), in turn, can push the yacht to a cruising speed of 30 knots and a top speed of 33 knots. The range is 275 and 245 nautical miles, respectively, at maximum speed, and 290 and 270 nautical miles, respectively, at cruising speed (preliminary data).